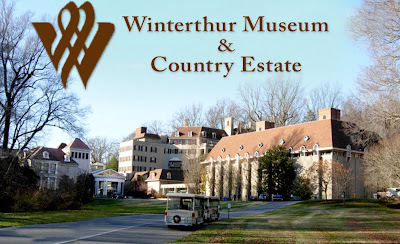 March 28, 2018--Have returned from this wonderful stitching retreat at Winterthur in Delaware and couldn't wait to write about it. 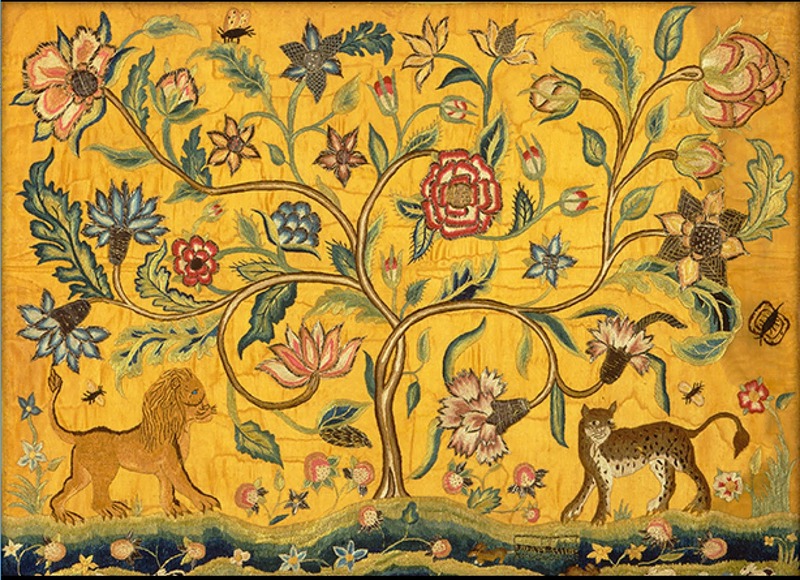 Firstly, I must talk about the class--Tree of Life. 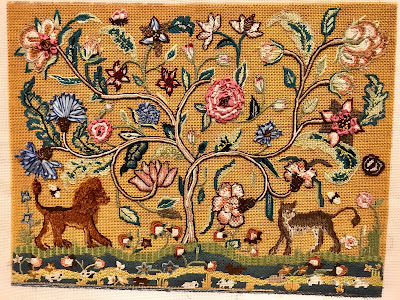 This was a two-day class taught by Elizabeth Bozievich, the Editor of Needlepoint Now Magazine, who stepped in to replace the woman who originally stitched this piece for us (from the Royal School of Needlework). Even though Elizabeth did not write the stitch guide, she did a great job teaching us the stitches used, and there are soooo many of them. I took lots of close up photos of the stitched piece to help me in the execution of all those wonderful stitches. There were many other classes offered at this event and I wish I could have taken them all. Now to talk about the schedule. 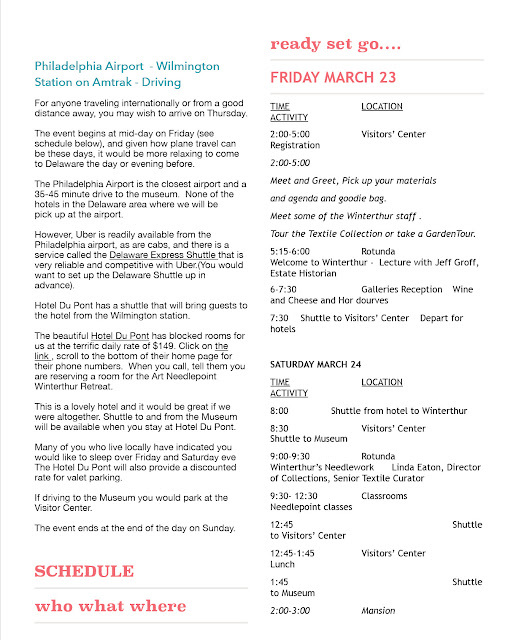 Below is a copy of the itinerary and there aren't enough superlatives to describe how well we were taken care of--from the beautiful accommodations at Hotel Dupont, to the tours and lectures at Winterthur, to the dining experiences. Lastly, the retreat participants....I met many wonderful stitchers who came from near and far. There were a few of us from Delaware, but most came from elsewhere. 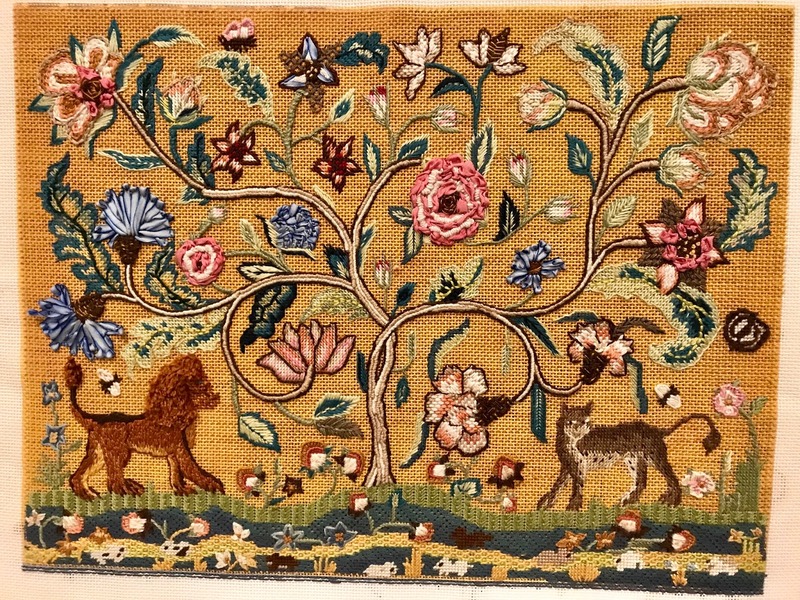 I've requested a Facebook page be set up for those of us stitching the Tree of Life so we can encourage each other as we work on this piece. 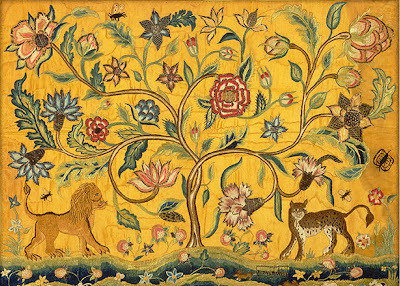 If Doreen Finkel of Art Needlepoint Company does this again, consider it a must do retreat. May 18, 2018--I just learned that Art Needlepoint is hosting a fabulous retreat at Winterthur Museum in Delaware from March 23 to 25, 2018. The initial brochure for this event can be found by clicking here. 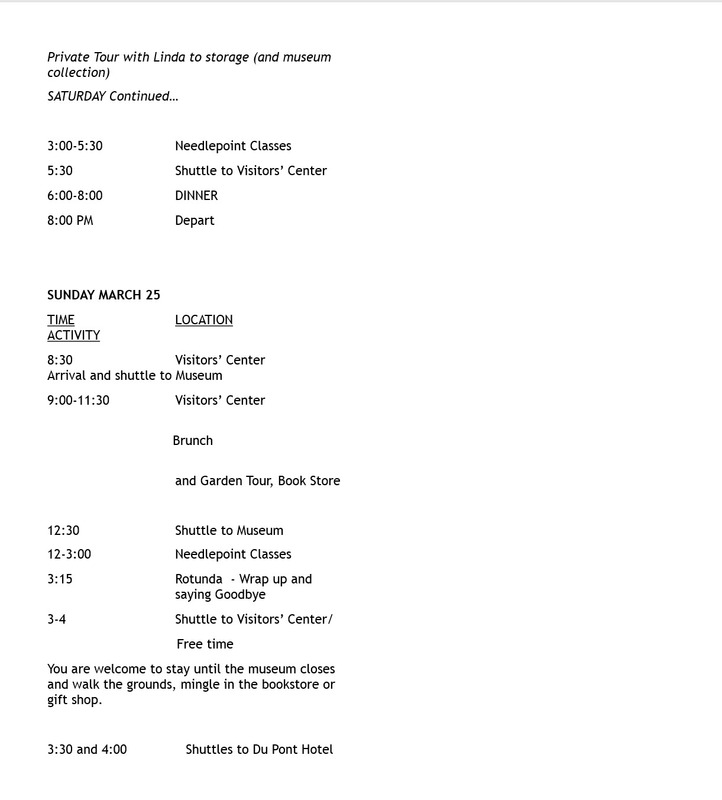 I'm told there's a 5% discount for ANG and/or Winterthur members. Of course, you can save a whopping 10% by registering and paying in full by July 15, 2017. 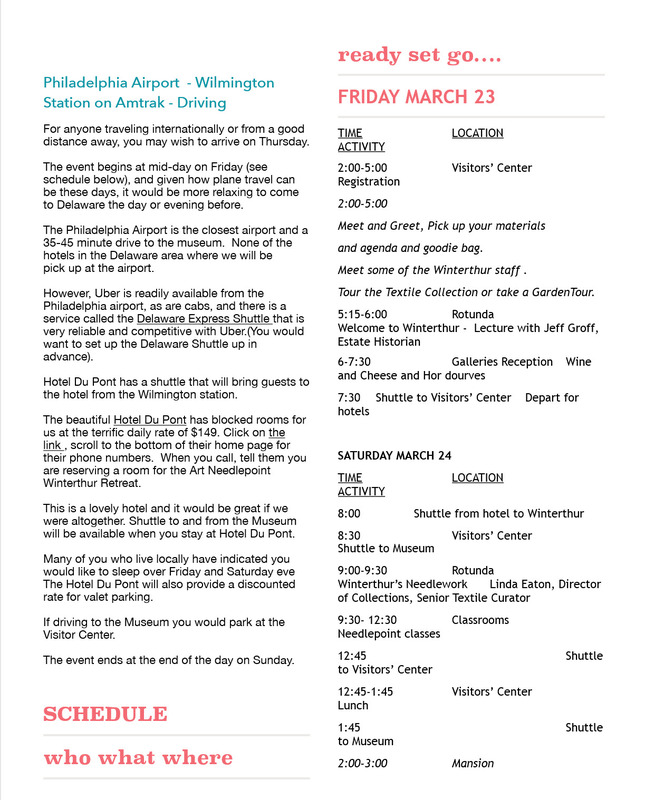 It promises to be a full weekend filled with fun and information, and let's face it--anytime you can stitch with like minded spirits is a very, very good thing. 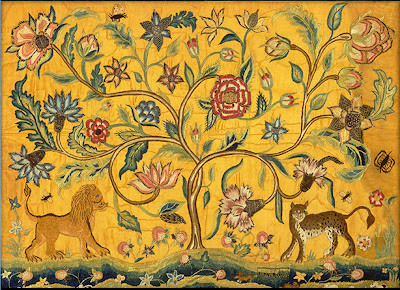 Click here to access Art Needlepoint website. I've been to every larger venue in the town and this is one of the best. Their menu is small but at least they seem to do what they have on it well. The NYC venues have a variety of salads and sandwiches, and a fresh daily soup. That's a full 2 days! Glad you enjoyed it. It's wonderful that you saw the original stitched design.